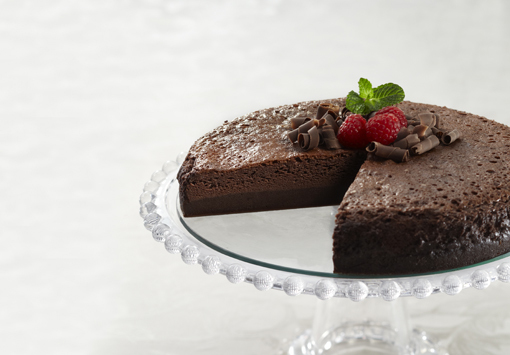 A rich and decadent flourless (gluten free) chocolate torte topped with a chocolate ganache! This recipe is sure to impress chocolate lovers! 2. Spray 9″ spring form pan with non-stick cooking spray. Line bottom with a circle of parchment paper. Spray paper with cooking spray. 3. Break CANDIQUIK® into small pieces and place CANDIQUIK® pieces and 1 cup of butter in Melt & Make™ Microwaveable Tray, and microwave on high for 45 seconds to 1 minute. Stir well. Heat for an additional 15 seconds if needed and stir until well blended (do NOT overheat coating). 4. Pour CANDIQUIK® mixture into large bowl. Add sugar and mix well. 5. Add eggs, one at a time, mixing well after each addition. 6. Sift cocoa on top of mixture and stir well. 7. Pour batter into prepared pan. Bake for 35-40 minutes, or until cake has risen and top has formed a thin crust. 8. Cool for 10 minutes. Invert pan onto a plate and remove sides of spring form pan. Remove parchment paper. 9. Combine 2 squares (4 oz.) of CANDIQUIK® and 3 tablespoons of butter in a small saucepan over medium heat. Stir until smooth. 10. Remove from heat. Stir in vanilla, honey, and milk. Set aside to cool slightly. 11. Pour glaze over cake, smoothing glaze over the top and sides of the cake. *TIP: Garnish with fresh berries, whipped cream, or powdered sugar.